Prevent your dog from getting lost to avoid the heartache. A surprising number of dogs are lost everyday as the result of avoidable or careless errors on the part of their humans. Dogs are much like two year old children who need protecting. Knowing ways to protect and safeguard your pet can help to prevent your dog from getting lost. Above all else, when you first get your dog, get him microchipped. This is a simple procedure done in your Veterinarian’s office. A teeny tiny transponder, about the size of a grain of rice, is injected beneath the dog’s skin between the shoulder blades. A number is assigned to each chip and it will be registered with your name and information when you activate it online. The chip itself is dormant but when a special handheld scanner is passed over it, a signal is activated to transmit the information assigned to that chip. Price is very reasonable to do this. We decided to register our dog’s chips through the American Society for the Prevention of Cruelty to Animals (ASPCA), which charges $17.50 for a lifetime enrollment. No matter who you register through, the information is fed into a national database. If a shelter picks up your lost dog, they will scan and then notify you that they have them. If someone finds your dog, they can take them to any veterinarian or shelter to be scanned. Be sure to keep your information updated with your registry as to any change of address or phone numbers. According to the ASPCA, dogs without microchips are returned home 21.9% of the name, while dogs with microchips are returned home 52.2% of the time. 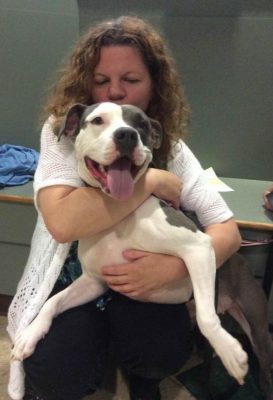 Further, the ASPCA states that in cases where microchipped dogs could not be reunited with their owners, it was usually due to the chip never being registered or the information not updated. Although microchipping will not actually prevent your dog from getting lost, it will help to get him home quicker. ID tags are another item that will not actually prevent your dog from getting lost but helps to get them home sooner. The ID tags should not be used in place of the microchip, but rather, in addition to it. Tags can fall off or become unreadable over time. The nice thing about tags, providing they are readable, is that anyone that finds your dog will be able to notify you immediately. Your dog should never be allowed to be outside without being inside a fenced area or on a lead. Make sure your fence is high enough and the gates are secure. Regularly check the fence to insure it is in geed repair and that your dog has not dug any escape routes under the fence. While I prefer a fence to a tieout, if the latter is necessary, make sure it is the proper strength for your dog and that it is in good shape. Don’t leave your dog tied out unsupervised, as it is too easy for him to become tangled or hung up. When your dog is outside in the evening, be sure to have the area well-lit. This can help to deter potential dog-nappers. The stealing of dogs is a very real problem. We talk more about preventing your dog from being stolen here. Using gates between doorways, especially in ares that lead to outside door, can help prevent your dog from getting lost. Many times I’ve heard about children carelessly opening doors or leaving doors ajar, only to have their beloved pet make a getaway. Make sure your dog’s collar fits properly, not too tight but not too loose. I actually prefer a harness to a leash as it is harder for the dog to wiggle out of and does not pull on the dog’s neck when walking. The leash should be a proper size in accordance with your dog’s weight and strength. Sometimes, even with all your best precautions, your dog may become lost. 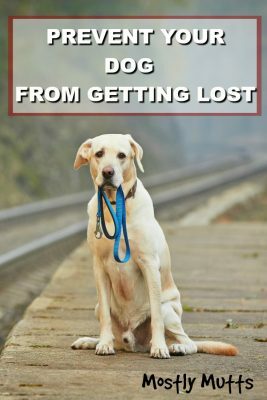 Here are some great ideas to Help Find A Lost Dog.